Please check back as our events page will be updated with new events as we schedule them. 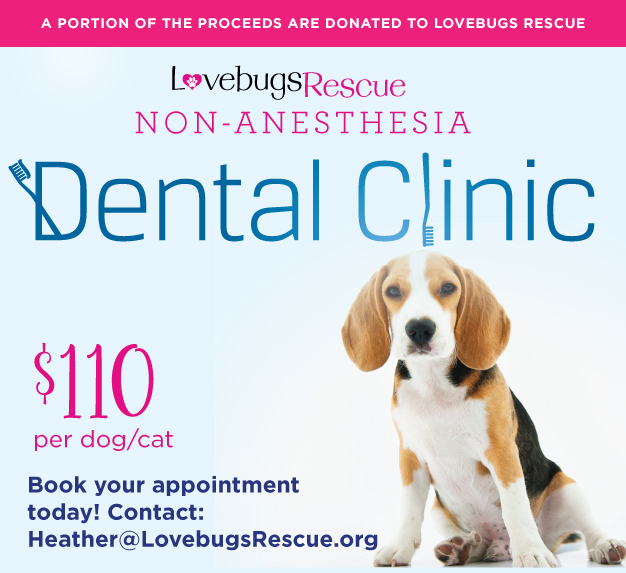 To secure an appointment time for this popular non anesthesia dental clinic, please email heather@lovebugsrescue.org and include your dog or cats name, your time preference and last name. The clinic location will be at a vets office in Tustin, dental services performed by Animal Dental Care. Cost of each animal is $110. You can wait in the lobby while your animal is being done or arrange for a brief drop off. It takes about 30 minutes. You will be provided your appointment time and address of the location once your RSVP has been confirmed.